Where Can I Find My Facebook Tracking Pixel? 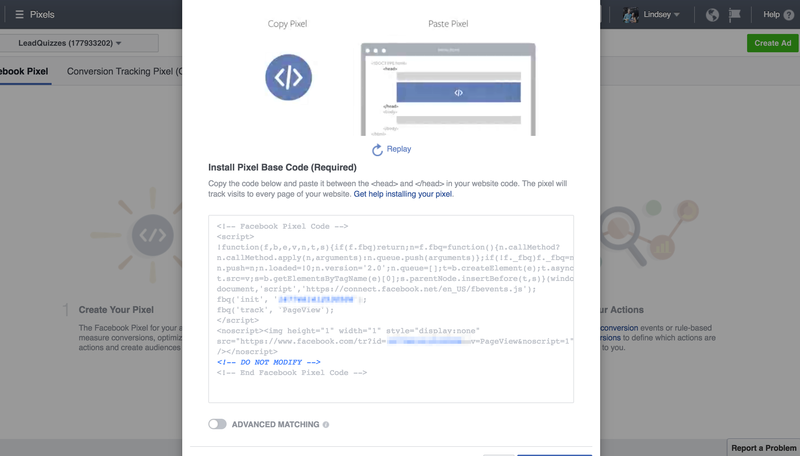 You will need your Facebook tracking pixel to accurately track how well your Facebook ads are performing. To find your Facebook tracking pixel follow the steps below. 2. Click where it says "Ads Manager" in the top lefthand corner. 3. Select "Pixels" from the drop down list as shown below. 4. If you do not already have a pixel created follow the steps to create a pixel. If you do click "View Pixel Code"
5. Copy and paste the code shown below into LeadQuizzes to add your Facebook Tracking Pixel.